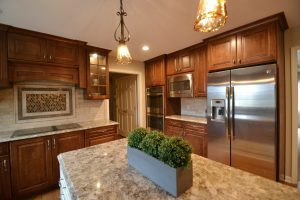 Sometimes when it comes to remodeling, the subtle changes can make the biggest impact in a space. This holds true for this once tired kitchen. The original layout proved to be functional, however the island was reconfigured for a better use of storage. 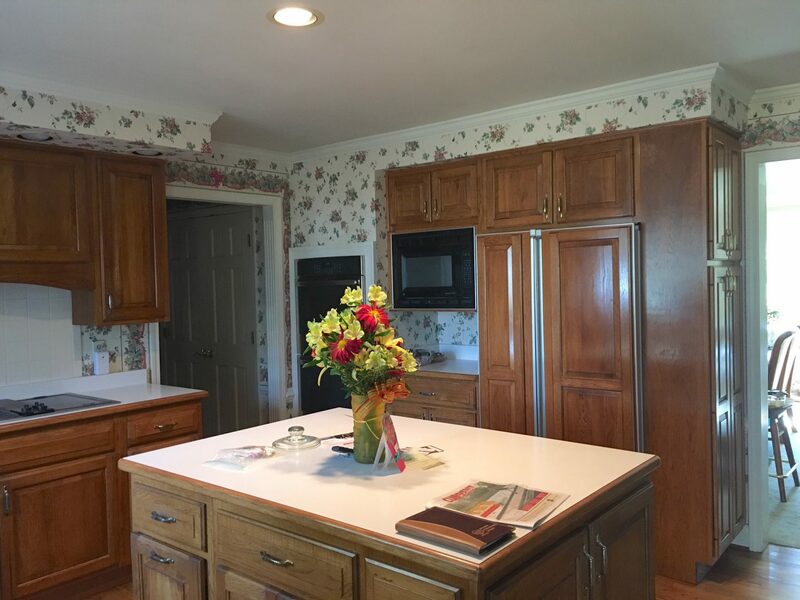 The wall that housed the double ovens was replaced with cabinetry and the bulkheads were removed allowing for the cabinets to be installed to the ceiling giving the illusion of a larger room and a more custom feel to the space. The desk adjacent to the eating area was replaced with a custom-built china cabinet complete with glass doors, decorative mullions and interior cabinet lighting perfect for displaying glassware. The decorative glass doors are repeated on either side of the cooktop creating a focal point upon entering the kitchen. 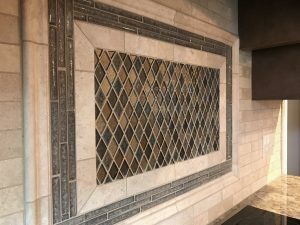 The crushed glass mosaic blanket behind the cooktop enhances the focal point of the room and pairs nicely with the 2”x8” travertine modified subway tile. The original neutral color palette was updated with rich amaretto stained cabinetry and elegant Cambria countertops. 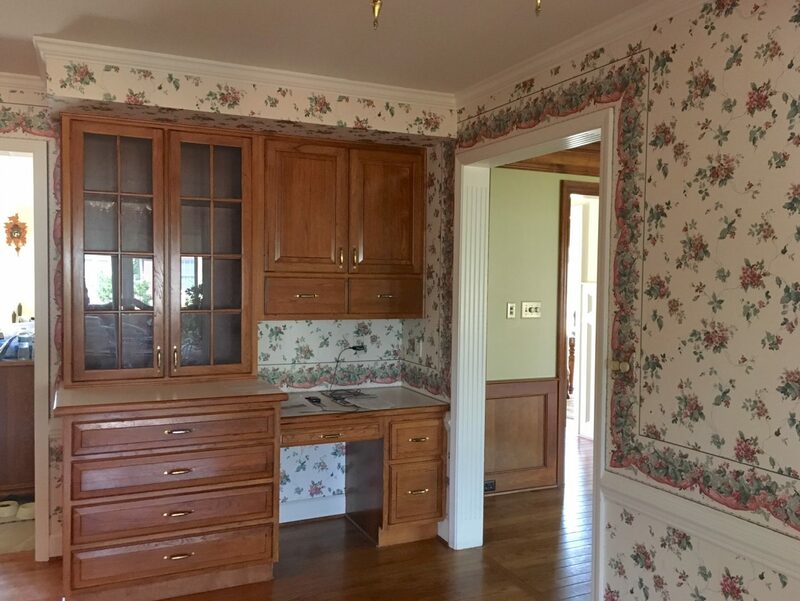 The raised panel cabinet doors and decorative trims and moldings keep this kitchen feeling traditional and timeless. 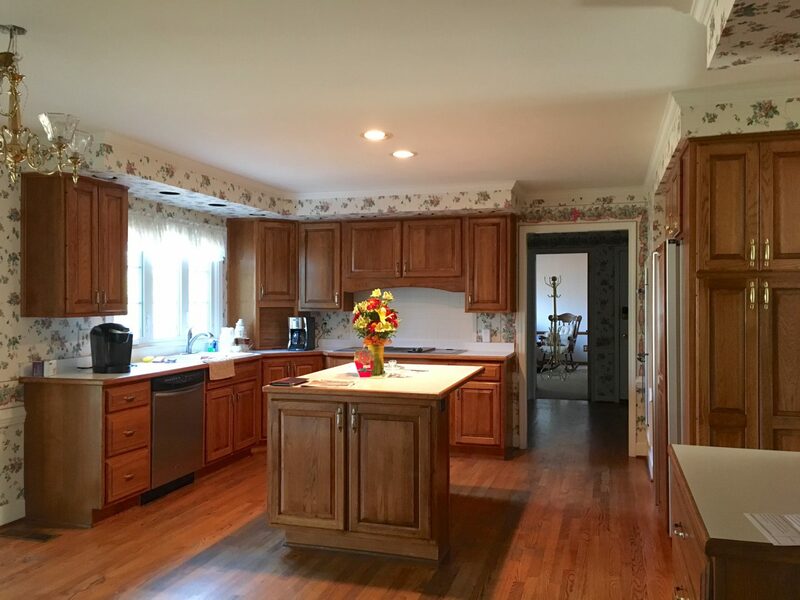 The floors were sanded and refinished in a slightly lighter color contrasting with the darker perimeter cabinets and painted island creating a dynamic feel to the space. The combination of neutral tones with the variety of materials and textures keeps this room stimulating, but not overpowering. 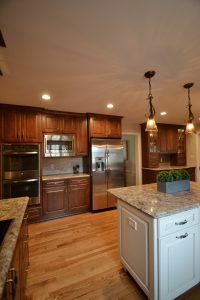 Recessed can lights create uniformed light throughout the room, while the pendant lights above the island, the lights in the glass cabinets, & the under cabinet lights serve as excellent decorative lighting allowing for a comfortable space. 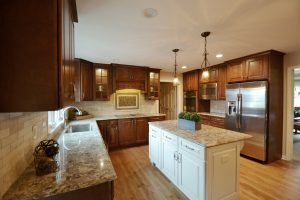 Although no major modifications were made with the layout and color palette of the room, by updating the materials using warm and rich colors, this Carmel kitchen was elegantly rejuvenated.